A survey in Bangladesh revealed that rural electrification could lead to an increase of income in the range of 9% to 30%. This impact is sustained for as long as 8 years. A study in the Philippines showed that electricity increases study time by approximately one hour per evening. Nearly 40% of the world’s population rely on solid fuel to cook food breathing in toxic smoke that kills nearly two million people a year, most of them women and children. Simply put, lack of electricity means permanent poverty. The challenge that was posed to us by a national publication was to design a solution that addresses the energy access problem for developing countries. Given the scope of the problem and its severe impact on the well-being and living conditions of such a vast part of the global population, we needed to reach as large and as diverse group of people as possible. Through a user-centered process of inquiry we explored the context, target audience, and nature of existing solutions. While lack of electricity is prevalent in Sub-Sahara Africa and Asia, the geographic conditions in these areas are diverse. First, the main source of energy is different – in South/South East Asia it is flowing water, in some parts of Africa it is solar, in others wind. Second, seasonal changes call for different ways to capture renewable energy resources. Therefore, in order to have the greatest impact across geographies, our solution needed to address variations in the natural resources and seasons. Despite these differences, our experience and research showed that people shared technical ingenuity, entrepreneurial spirit, and a strong sense of community. This insight led us to the conviction that our solution needs to support multiple uses, and give people the freedom to use it in a way that empowers them to build a better future for themselves. Existing imported solutions are closed systems, accepting a single source of energy and supporting a single usage. Local solutions lack safety and have negative environment impact. To our list of objectives, we added the need to maximize safety and reduce environmental risks. Juice Box is an open energy system that allows people to capture energy, store and transport it to where it is needed, and power devices in remote locations. It is context independent and supports multiple sources—from the electrical grid, to solar, car battery or even kinetic. It centers on human needs and improves ability to work, learn, get access to information, create better living conditions or new business opportunities. It gives people, regardless of where they live, safe and reliable access to much-needed power to make their lives better. 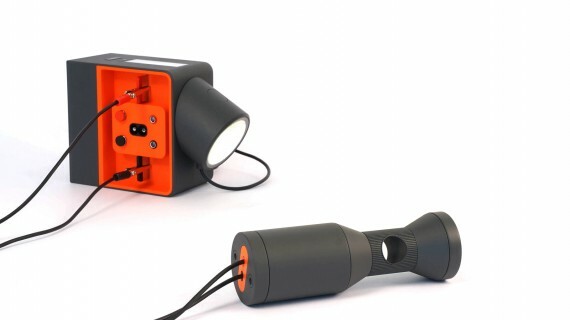 A detachable light with versatile settings, enabling people to work or study after dark, helping increase income and education. Swappable batteries that can be stacked together for extra energy or rented out, for new business opportunities. An input panel that safely connects to multiple sources, including raw cables. Multiple outputs that could power phones, tablets, a smoke free stove, ventilators, medicine refrigerators, and more, all improving the health of families. A clear display calculating time remaining, so people can plan ahead. 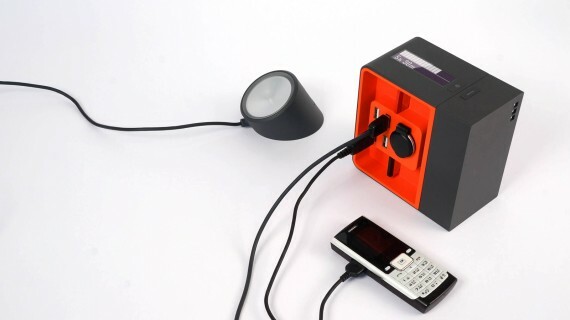 A dynamo that harnesses kinetic power and enables manual charging in case of emergency. Simple shapes fit with a wide variety of interior and exterior locations. Smart use of color gives understanding of how to use Juice Box regardless of language. Bi-stable LCD display with dual modes communicates charge and time left depending on connected devices, screen only draws energy when the display is changed. LED light with dual illumination settings for focused and ambient lighting. Energy input panel works with a variety of manufactured connectors, raw cable or alligator clips; recessed connector locations for safety. Expandable swappable batteries enable larger storage capacity; single battery is 14.8 V Li-Ion made of 6 cylindrical cell pieces; USB port supports renting batteries. Dynamo captures kinetic energy; traction treads for connecting different types of belts for wind and hydro; counterweight opening for attaching and swinging weights to generate light in emergencies; traction channel accommodating surface contact with different sized tires on bicycles and motorbikes.